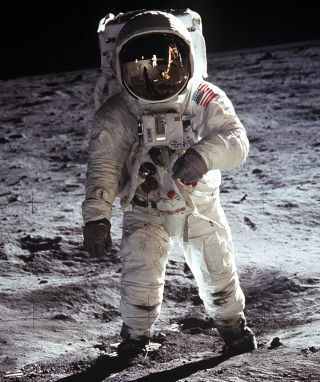 Apollo 11 astronaut Buzz Aldrin walks on the surface of the moon on July 20, 1969. Aldrin — the second man to walk on the moon — will take part in a live Google Hangout with Space.com Monday to discuss everything from the future of lunar exploration to the 45th anniversary of Apollo 11 coming up on July 20. You can watch the Apollo conversation starting at 12 p.m. EDT (1600 GMT). The Apollo 11 moonwalker recently started a campaign in honor of the anniversary of the moon landing asking for people around the world to share their memories of Apollo and how it inspired them. Called Apollo 45, Aldrin is asking space fans to upload their remembrances to social media and tag them with the hashtag #Apollo45. "I feel we need to remind the world about the Apollo missions and that we can still do impossible things," Aldrin said in a video announcing the Apollo 45 project. "The whole world celebrated our moon landing, but we missed the whole thing because we were out of town. So now, I invite you to share with me, and the world, your story or your family's story of where you were on July 20, 1969, or feel free to tell me how the Apollo missions inspired you." Neil Armstrong and Aldrin touched down on the surface of the moon on July 20, 1969 after launching from NASA's Kennedy Space Center in Florida on July 16, 1969. NASA astronaut Michael Collins stayed in the command module while Armstrong and Aldrin made their way down to the lunar surface in the lunar lander. In total, the astronaut pair spent 21.5 hours on the moon before successfully returning to Collins in the command module.